full digital regulating function. These features make "Metal Safe"
running stability and easy handling, etc. 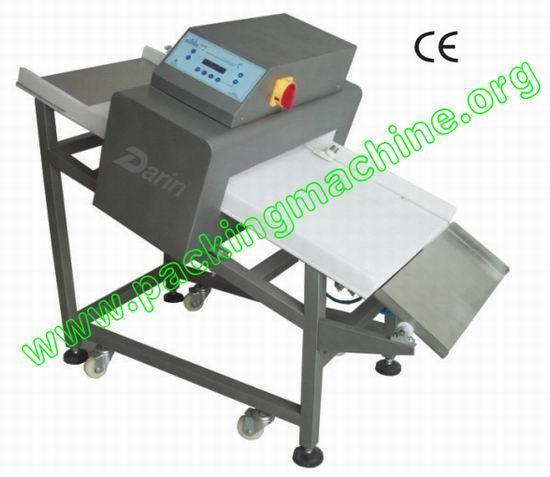 Applications: Metal Detector can be used in the industry of food, medicine, toy, chemical and leather, etc. to detect and remove the iron grain, needle, lead, copper, aluminum and stainless steel, etc. It can be also associated with the machine with automatic product line. LCD Touch Screen: LCD touch screen makes operation more simple and appearance more beautiful. High Reliability: The sensor and framework of Metal Detector are made of stainless steel, full digital circuit, SMD technology and auto-adjustment feature can reduce the noise strongly and makes the machine work in the optimal state. Self-study Function: Production-effect compensation can be studied with the "Metal Safe", particularly for the electrical conductivity of salted and most product effects can be saved in the memory. Easy Handling: Digital balance adjustment, auto product-effect compensation, LCD screen and user-friendliness interface management make "Metal Safe" handle simply. It is for washing and has the function of water resistance. Alarm, stop and then eliminate the product (with elimination device).